Baler is a charming provincial capital of Aurora and location of the famous surfing site for Luzon due to waves coming from the Pacific. What’s so endearing about this lovely town is that it is not limited to the experiences from the beach. Covering a vast plain and some forested area rich with local floras and faunas, natural falls some with famous majestic cadence, rock formations along the coastal areas that is a delight to landscape photographers, and even so for the rich political history and historical contributions this quaint little town and the province it uphold offers. 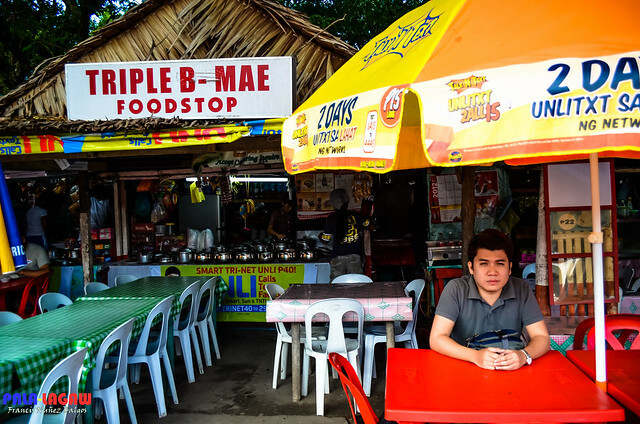 Most but not all, I’ve explored in a day aboard a local tricycle with a hired humble driver. 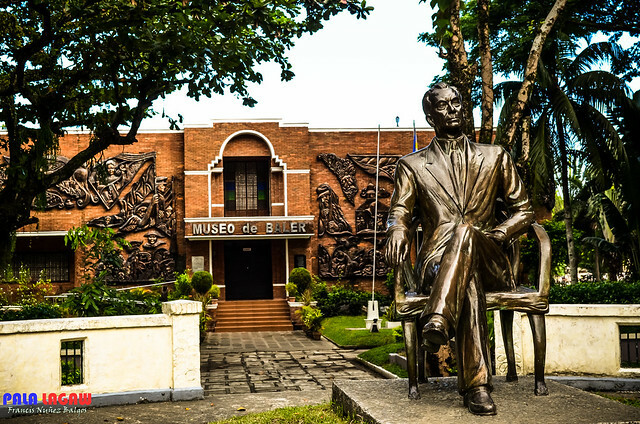 I’ve had a field day just walking along the plaza, circling the monuments of Manuel L Quezon and his wife, what’s left of their post Hispanic house, the Baler Church made famous by the siege of Baler and of the remnants of the end of Spanish occupation in this country. Dining, not on some posh restaurants but by the rolling store, a string of carinderia’s along the plaza, this caps the backpacking experience by dining on great Pinoy food, along the scenic sidewalks covered in shades by huge Acacia trees, and the local traffic of children walking to and fro in school uniforms, with tricycles passing, and buses whistling around the corner. The waves, I came for the waves, thought I can handle the waves of Baler after my regular surfing stint in Zambales. But the waves, lovely and strong as they come, prove too much for my amateurish surfing aspiration. There’ll always be next time but it didn’t end there as is my backpacking adventure is just halfway. It was a huge set back for me, coming from a busy lifestyle in Manila. The nights are quite, and walking feels safe with light rains giving their blessings. Here is where I knew I can finally slow down and feel the moment, forgetting the time as it slowly tick its countdown. But eventually, I grew bored of watching the tricycles just passing by, so hailing one of them after breakfast on a Sunday was a great start. 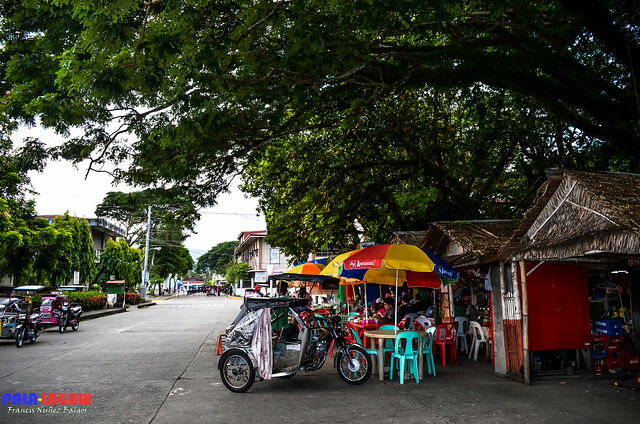 Some of the tricycles here are registered tour guides, providing services to people and bringing them along a few locations surrounding the town of Baler. Since before coming here, we where ready with marked locations of the places we have in mind. With my travel buddy knowing the standard rate, we talked to an unregistered driver hoping we could get a cheaper alternative since we only wanted to stick to the locations we wanted to visit. Lucky we met our driver for this day; he was even younger than us and only drove his tricycle when he’s not on his day job. But of course, we have to make certain that he knows the locations. He was eager and knows them, we were lucky he agreed for the discounted price, and really it was a great bargain as he wanted to visit these places too by himself, we just handed him a reason to do so. Wiped Out. I'm a novice Surfer who underestimated the waves of Baler. View of the Rolling Stores under the shades of Gigantic Acacia trees on the side of the Plaze. So it was that for the entire day, our driver became our travel buddy, exploring the Millennium tree of Aurora, The Caunayan Falls covered under rich foliage in the middle of nowhere, the majestic Ditumabo falls dubbed as the mother falls, The Ermita Hill that showcases the vantage view of the Baler Bay, The Baler Municipal Fish Port that was a side trip, The historic Baler Church and the rest house of Manuel L Quezon and his wife Aurora Aragon Quezon, and the Diguisit Islets that was a delight as a destination for families and scenic location seeking photographers. Sure it was a lot to cover in a day, lucky that I was able to muster all the strength to enjoy each of these places. Leaving Manila early in the morning, Genesis Transport, Inc. provides direct bus trips to Baler, Aurora from Cubao, Manila. First bus trip from Genesis starts at 2 AM and succeeding trips in every hour until the last trip at 7:30 AM. 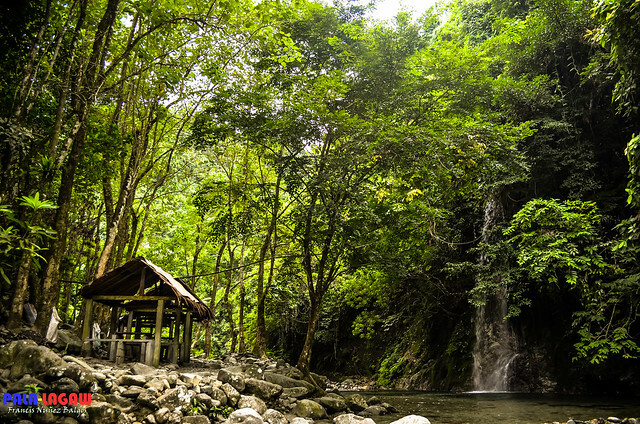 Knowing that Aurora province is nestled within Sierra Madre Mountain Ranges, some of the roads will have to pass through some deeply forested areas. Taking the first trip would be good considering that you can relax along the way. 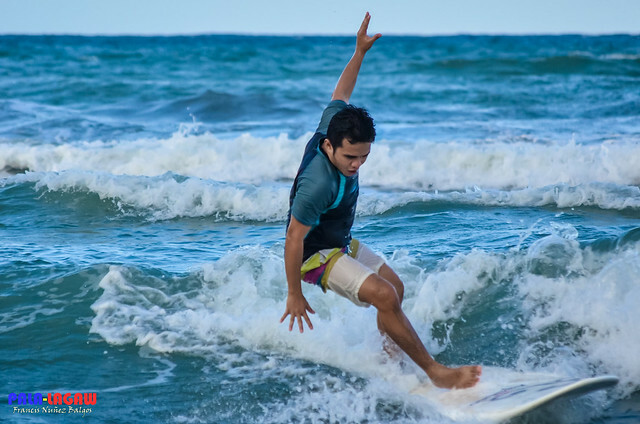 Arriving early in Baler would give a head start in Surfing along Sabang Beach or an early photo walk in Baler Plaza. 2nd option in getting there is to take a bus to Cabanatuan, Nueva Ecija. Alight in the Central Terminal and from there you can take a bus bound for Baler. NOTE: Surfing season can pose a challenge to getting a bus ride, especially on a weekend with surfing enthusiast milling over every bus seat available. Get to the terminal early to secure a seat and number with the guard. 12:30 AM - Left Manila with a direct aircon bus trip to Baler Aurora, through Genesis Transport. 6:45 AM - Check in MM lodge and rest after a long bus ride. 7:30 AM - Hired a tricycle to Rolling Stores for Breakfast. Rolling stores are beside the plaza. 8:00 AM - DIY Photowalk of Baler, tour arround Baler town. 9:30 AM - Went back to Sabang Beach to chill out with beers and watching Surfers. 8:00 AM - Hired a tricycle driver for a guided tour and transport. 1:40 PM - Left Ditumabo falls for Diguisit Beach and Islets. 4:40 PM - Visited Baler Church, capped the tour with a Sunday Church Mass. NOTE: We left Manila on a last minute decision, and MM Lodge was the only one to respond to our inquiry even though it was late at night. Great for backpackers. The lodge has a homey feel on it, and the landlord was housed just a few doors from our room, it was still very early when we arrived but we were accommodated graciously. We took a fan room for Php 500.00 fair enough considering that we were mostly out exploring Baler and the surrounding locations. The water in the tap has a heavy rusty smell on it. The lodge provides fresh cotton bed sheets and clean blankets for the bed, and really quite location. They have easy access to the beach which right at the back of the lodge, need not search for Surfing instructors as they are just beside the lodge. The fan room can easily upgrade into AC Room upon request, with additional fee. We didn’t feel the need to take Aircon though as the room is fairly cool. For comprehensive list of accommodations, check this link from Discover Aurora. I didnt have any mishaps in Baler, probably the only roadblocks Ive encountered is paying for entrance on every private owned lands along the way to Caunayan Falls. Think I missed that cove.. I have been planning a trip to Baler thanks for this itinerary now I know what I can fit into my schedule. 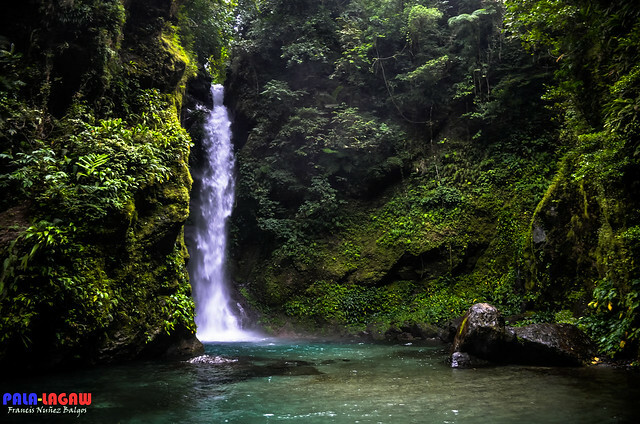 Baler is one of the places I'd want to visit for a nature adventure. The place is just scenic. 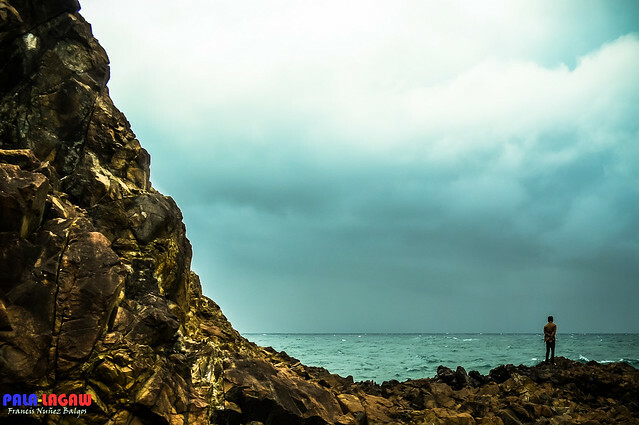 Baler is one of those destinations that is accessible for most vacation seekers who are looking for a quick weekend getaway. Thanks for this itinerary! The information you posted is very useful. I am also planning to go to Baler and I will bring my new Folding Bike there? What can you advise me? Sir Cheap, Baler is perfect for biking.. 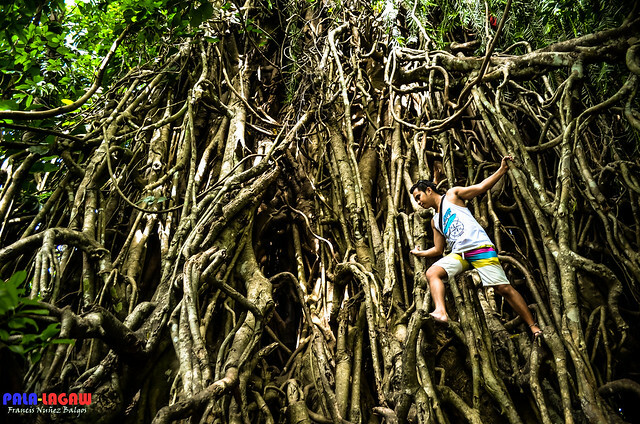 The waterfalls and the roots are just amazing, a nice place to visit indeed! i haven't been in this place. 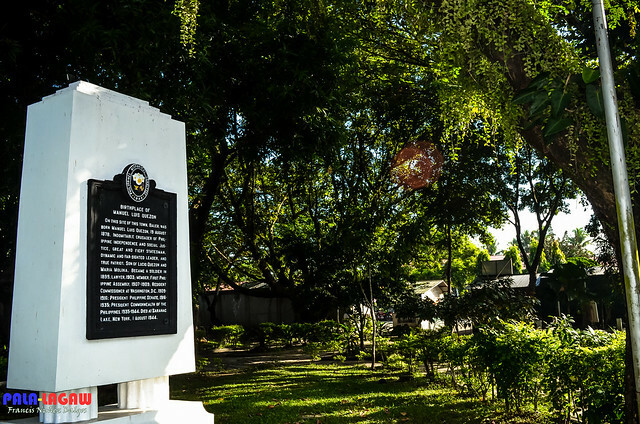 nag ganda pala ng mga lugar dito. .
Aurora is a very interesting place!! Hey, I'm a novice surfer too! My waters are in Zambales, but friends have been asking me time and again to experience the waves at Baler :) Maybe in a couple of weeks! Thanks for the well researched post. Really helpful since plano namin magBaler this July. Yung contact number eh nasa last part ng post above..
mgkno po ang rent ng tryk for the tour? Paid Php 600.00 for a whole day trip. hi, just want to ask how much did it cost you the whole trip? :) just thinking if it will save us money if we engage in any tour package, thank you! This is a DIY back packing trip sir. the amount would actually depend if you prefer comfort over just neccesity. i think my budget here was 3,500 per head, give or take. Its actually too much for back packing, since I took a eat all yoou can buffet dinner on the last day. The surfing instructors are fairly affordable. 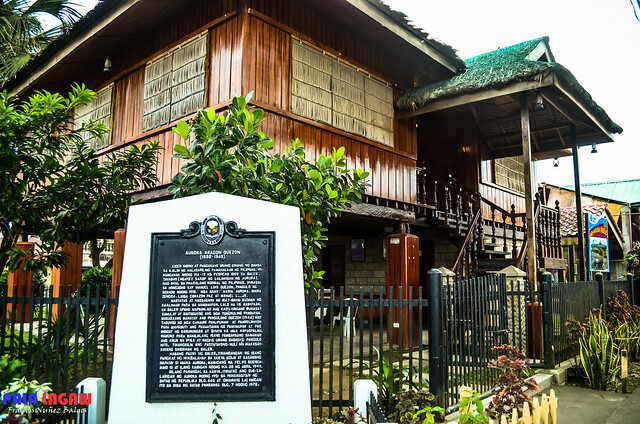 Find exotic Transient house, apartment and condo in Baguio.